-Mr. Kevin Siak of Pavilion Green; Sep 2016. "Thumbs up.. the service is superb. The serivceman is polite and professional. 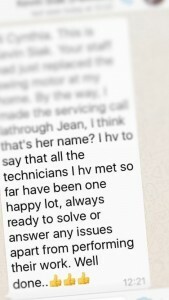 He will explain what are the situation of each aircon (if got slight problem) and advise what you should do, but never push you to service it if the problem is still ok... Very satisfied. Will call for service again!" "Thank you very much for your speedy response. I am very much impressed with the way your company operates. Thanks again for your excellent service." "Good day, I and my family also very satisfied of the service. Will recommend friend and looking forward for your service again." "Top notch service for the price paid. Highly Recommend. Servicemen were polite n punctual. Service was possible n thorough for the price paid. Would definitely use their service again n will definitely recommend to family n friends." "Hello, Coolforce, your technicians did a good job. I find their work quite satisfactory. Thank you. Have a nice day." 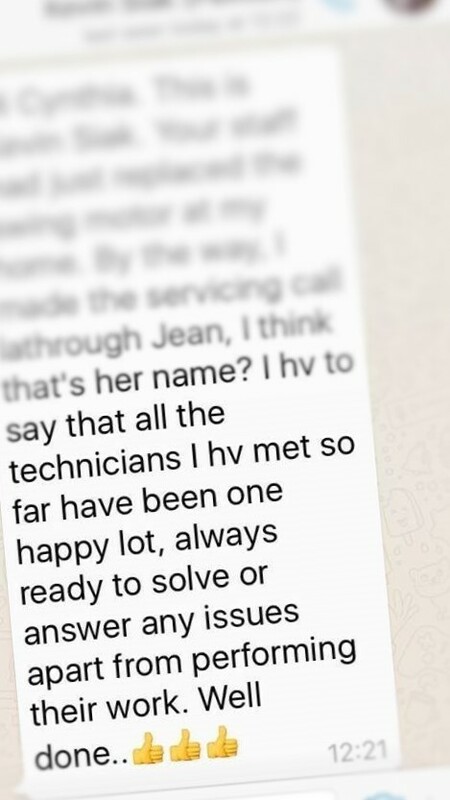 "Thank you for your technicians’ punctuality and good servicing on my Air-Con. Coolforce has exceeded my expectations – good job." Thanks for your service that you provided, we really appreciate. Your staff was very nice." – Ms. Martine of Central Grove. "Technician come on time even earlier than appointment time, clean thoroughly including external condenser. The leaking was fix after the servicing. Very good and will use the service again." "Very good service, reasonable price, friendly staff and very patient while explaining and very on punctual. Will go for this company again." "Best Service I've ever received. Will change to this service company... The best servicing session I've ever experience since using air con 6-7 years ago..."
"Super good services; will call again next time." "I used to have online offer aircond cleaning service before but this Coolforce did an excellent job. I have decided to made a year contract with them." "Great customer service, knowledgeable technician. Will use again next time!" "Well! done ! Appointment scheduled was fast.. friendly worker hardworking efficient and polite ! Price was very reasonable too ! Will highly recommended to friend !"